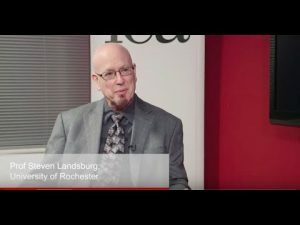 Steve Landsburg went to Chicago to do his graduate work in mathematics but was intrigued by the economics taught by Milton Friedman, George Stigler, Gary Becker, and other luminaries. We discuss the essence of Chicago price theory, the time when Steve was picketed by campus feminists, how Steve can climb aerial silks like Batman (while Bob looked more like the Penguin), and puzzles from his new book. Can You Outsmart an Economist? Steve Landsburg’s new book. The Armchair Economist, one of Steve’s earlier classic books. Murphy vs. Landsburg on Krugman’s take on government debt burdens. Murphy vs. Landsburg on escalators. Steve gets into trouble when he blogs about Rush Limbaugh and Sandra Fluke. Steve doing aerial silk heroics (one and two). “Carbon Taxes and the ‘Tax Interaction Effect,'” EconLib article by Murphy. The sound engineer for this episode was Chris Williams. Learn more about his work at ChrisWilliamsAudio.com. Christian and economist, Research Assistant Professor with the Free Market Institute at Texas Tech, Senior Fellow with the Mises Institute, and co-host with Tom Woods of the podcast "Contra Krugman." Thank you. I am so down after my post on Quora today which pointed out the benefits of a hard money standard was laughed at and ridiculed, and I was abused for not understanding that “no economist” supports hard money, that it’s “settled science”, etc. I need some good economics, and am looking forward to your show. Bob, are you really a christian and a communist? For me, the most interesting thing about this podcast was discovering which pronoun Bob would use for Deirdre McCloskey! At the end he says attractive people who teach do it because they’re good at it, because attractiveness doesn’t matter for teaching. But does it really not matter? I think the argument has a lot of holes. I don’t know how academia works, but it’s not that far off to think that people who are paying for their education would be willing to pay a plus to be around attractive people, or that the person who’s hiring might take into account personal preferences for the people he’s going to be working with. It is not clear looks matter more in retail or hollywood than in academia, and it’s not clear somebody would choose a career with lower average pay than academia (let’s be honest, most people working retail or being C class actors aren’t exactly millionaires) just because that average happened to be raised a little from the mean across the general population just because the person happened to be a little more pretty than average, assuming looks do indeed matter more there than in academia. And lastly it wouldn’t be that surprising if looks happened to be correlated with IQ, personality, education or other socio-economic attributes. And I quote “rest” because it sounds like a word probably specifically chosen instead of the more natural “wait”, to prime the listener to think about getting temporarily exhausted from walking and stopping to catch breath rather than the simple fact that people don’t want to walk and would rather be transported. In fact, how is the supposedly naive response “because stopping on a fixed stair won’t get them anywhere, duh” wrong in any sense? The whole point of escalators IS so people don’t have to climb stairs.